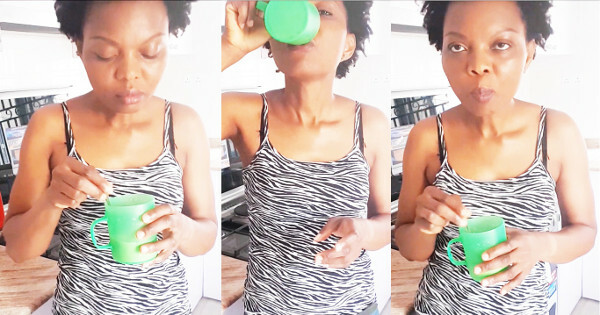 Drinking Nigerian Tea in 1, 2, 3. Nigerian "Tea" is not what the rest of the world calls tea. I honestly do not know why we started calling this tea but everyone, the learned and the not so learned call it tea. Even those who know that it is not tea call it tea anyway because they want to make sure they are served the correct drink when they request for it. Nigerian "Tea" is the most popular breakfast when teames with bread, cookies and many more sides. Some people add sugar to the above but that's a no-no for me because Milo already contains large amounts of sugar so no need to add sugar to the Nigerian Tea aka Hot Chocolate. Pour the tin of Peak Milk into a mug. Add hot water to fill up the cup. Stir very well and that's it! Watch the video below to see me dunking, baptizing my bread in the tea before eating. Yum! Nigerian Tea goes well with bread, Nigerian Meat Pie and many Nigerian snacks, Fried Plantain, Akara, Nigerian Moi Moi, Nigerian Pancake, Fried Yam, Fried Potatoes, Beans Porridge, Nigerian Okpa, even Nigerian Puff Puff etc.